His immediate challenge will be to secure a majority in next month’s parliamentary election for a political movement that is barely a year old, rebranded as La Republique En Marche (“Onward the Republic”), in order to implement his programme. The euro currency, which had been rising for two weeks as the prospect receded that France would elect an anti-EU president, topped $1.10 in early Asian trading for the first time since the U.S. elections, before easing back. He plans to blend a big reduction in public spending and a relaxation of labour laws with greater investment in training and a gradual reform of the unwieldy pension system. A European integrationist and pro-NATO, he is orthodox in foreign and defence policy and shows no sign of wishing to change France’s traditional alliances or reshape its military and peacekeeping roles in the Middle East and Africa. France’s biggest labour union, the CFDT, welcomed Macron’s victory but said the National Front’s score was still worryingly high. On Sunday night, her deputy Florian Philippot distanced the movement even further from him by saying the new, reconstituted party would not be called “National Front”. Marine Le Pen on Sunday put a brave face on her crushing defeat to Emmanuel Macron in Sunday’s presidential election, pledging to overhaul her far-right party and turn it into the main opposition to France’s new centrist leader. 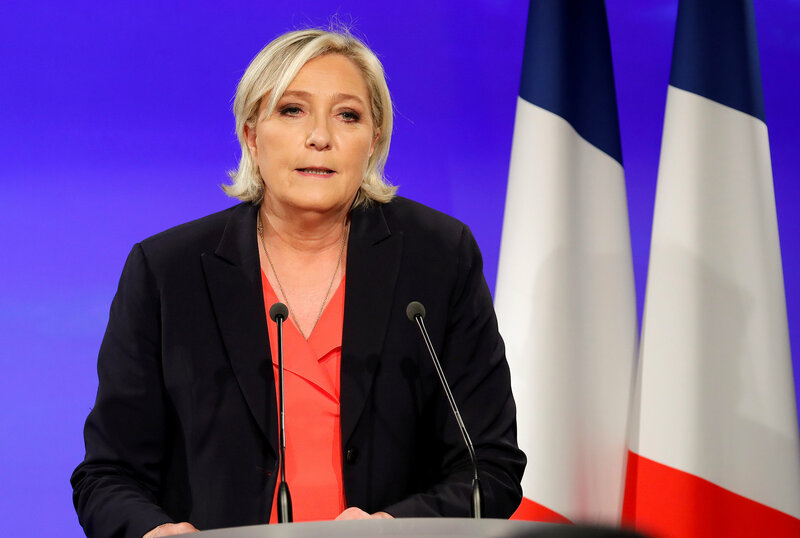 Analysts said she looked set to maintain her grip on the National Front (FN), despite criticism from some party members, including her own relatives, over her campaign. “I will propose starting this deep transformation of our movement in order to make a new political force,” she added. FN deputy head Florian Philippot said the new party would not be called the National Front, the party’s name for more than four decades. The brand is well known in France and abroad but is very much associated in voters’ minds with her maverick father Jean-Marie, who has been convicted several times for incitement to racial hatred. While Le Pen did not address the question of the party’s name, she said she aimed to reach out beyond the current FN and reconstruct the French political landscape around a “patriots” versus “globalists” divide. But achieving that goal will be no easy task. Nicolas Dupont-Aignan, the leader of a small nationalist party who backed Le Pen after he attracted just under 5 percent of votes in the first round, and whom Le Pen had promised to appoint as her prime minister if she won, said on Sunday he would not join her new party and would instead present his own candidates in the parliamentary ballot, independently of the FN. “If even the man who should have been her prime minister says he won’t be part of it, the question is, whatever the name of the party, who will be there and what its policies will be?” said Jean-Yves Camus, a researcher who specialises in the far-right. The conservative The Republicans party hopes to rebound in the parliamentary elections. 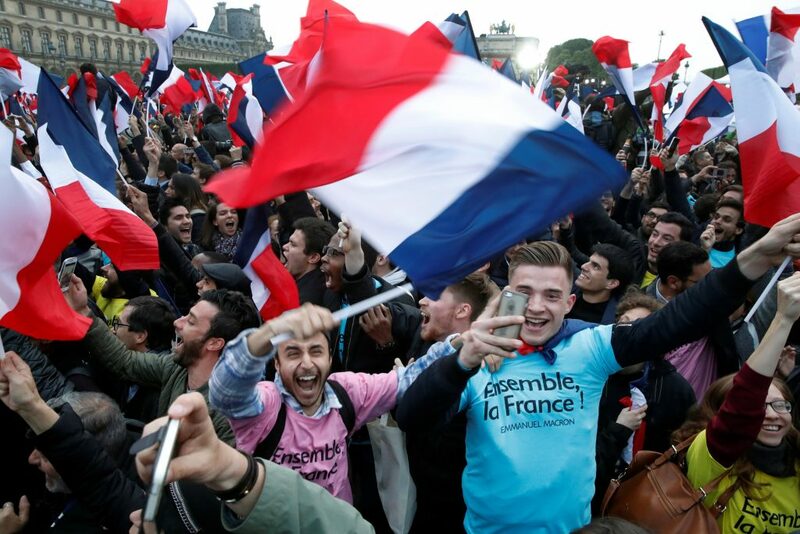 Its officials, and most of its supporters, are seen sticking to their party rather than joining the FN, analysts said. The OpinionWay-SLPV Analytics poll of 535 of the 577 constituencies found Macron’s En Marche! (Onwards!) party would emerge as the largest group, followed by the conservatives. In a party where the Le Pen family has always called the shots, Le Pen’s father Jean-Marie and her niece Marion Marechal-Le Pen, a rising star and FN lawmaker, said Marine Le Pen’s campaign had not been convincing enough and had been undermined by its position on the euro. A majority of voters oppose ditching the euro, which is at the heart of the FN’s economic programme. While Le Pen in the last days of the campaign appeared to soften her position on its timetable, Marechal-Le Pen said that came too late. Last Wednesday’s televised candidates’ debate, in which Le Pen constantly attacked Macron and seemed at times uneasy on economic issues, was also cited by analysts and supporters alike as a reason for the defeat. Despite the criticism, analysts said Le Pen’s leadership was unlikely to be challenged. “There is a lot of disappointment but no one contests her leadership,” said researcher Sylvain Crepon, of the university of Tours. He said that would remain true even if the legislative elections were also a disappointment. “Her grip on the party is simply too strong,” he said. “It’s thanks to Marine Le Pen that we got this historic score for our party, it is out of the question that she wouldn’t be with us to wage that new battle,” said the head of the FN Youths, Gaetan Dussausaye, while adding that the party overhaul would mean fresh faces and party structures.